Home Sweet Home... Tropic Days is a charming little Guest house set amongst tropical landscaped gardens and a relaxed environment. We are the perfect choice for the budget conscious traveler. Tropic Days has been recognised by the Lonely Planet as 'Cairns' Best Hostel' 4th Edition of their East Coast Australia Guide Book. Located in a quiet area, our guests can relax in our sparkling pool, or lie back in our hammocks and chill out to the music in the beautiful landscaped gardens. Or you can explore Cairns on one of our Free Bicycles. With our two well equipped kitchens, TV lounge and laundry, it is a real cosy and very comfortable place to stay. 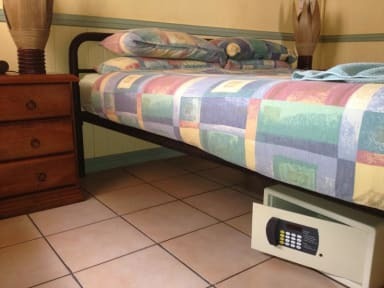 With comfort in mind we at Tropic Days offer various accommodation options such as , Deluxe Doubles ( with TV/ hard drive), Doubles ( *all Double rooms have Queen size bed) Twins, Singles, 3 and 4 bed dorms, as well as camping options. We supply full linen, towels, a personal safety deposit box in all rooms, plus free tea and coffee and a free light Breakfast of Bread and Spreads. There is also a fridge in every private room. We like to help you save money where possible! Our staff have excellent local knowledge too, so any transport needs, walks to do, or local conservation parks to see, you can just pop in and ask us. 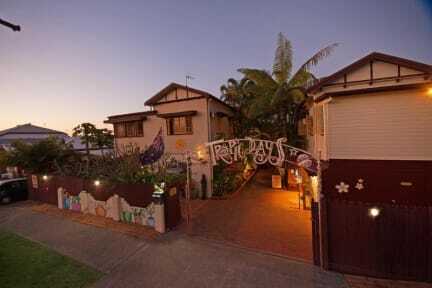 know you will have a fantastic stay here at Tropic Days backpackers. Our Tour & Information desk is here to help you. Loved this hostel. The people are so nice. Very clean, good facilities. It was an absolute delight to stay at tropic days! The staff was super nice and so helpfull! The atmosphere was great and the place was super clean! 10/10 recommendation:) Special shoutout for Kerri for all her help and assistence! staff are very friendly and helpfull, everything is very clean, and the hostel is super chill (except for aussie bbq evening - then its super buzy) - a bit far from the city center but there are a lot of free shuttles to town - it was very hot when we stayed there but there is airco (3 hours for 1 dollar) (airco is a bit noisy though). for this price absolutely the best hostel we stayed in. This hostel has offered me by far the best experience while backpacking. Facilities are mostly kept very clean, staff is very friendly and helpful, really nice atmosphere, lovely garden and the free shuttle to the center is a great extra. The 4-bed dormrooms are a little on the small side though, and while I was waiting at reception I heard some staff make nasty comments about other staff, which I thought was unprofessional and childish. The staff was very welcoming and always had a chat with you. The atmosphere was good: very chilled out. The garden was great: beatiful and quiet. There were enough shower & toilet facilities and they were very clean, just as both kitchens. Only downsides are the location and that you have to pay for airconditioning. Stayed here for three nights. Very friendly staff and nice rooms with just few people in it, also very nice garden with pool, hammocks and lots of space to hang out. 15 mins walk to supermarket and free shuttle to Cairns centre. Would recommend staying here.